Creating an illusion of seamlessly blending into the surroundings, infinity pools let you swim in style while enjoying cityscapes drenched in spectacular sunsets. Here’s a quick list of such pools our city has to offer. If you draw up a list of the most incredible infinity pools in the country, this one would definitely make it to the list. Swissotel’s infinity pool is a major draw for celebrities as well as hotel guests. Surrounded by palm trees, with a large lounging area, this pool gives the guests an opportunity to enjoy breath-taking views of the City of Joy reaching all the way to Kolkata airport. The pool is lit up beautifully in the evenings, making it the perfect spot to enjoy dinner and cocktails. 8,000 plus taxes. Call (0336626 6666. JW Marriott boasts of a spectacular outdoor infinity pool that offers unparalleled views of the city’s skyline. The Pool Bar, with a wooden deck and intimate cabanas will also captivate you with its ambience and unobstructed views of the city. The poolside here is perfect for charming sundowners and Sunday brunches. Pocket Pinch: INR 1,200 plus taxes for two hours. If you book a massage with the spa then you can use the pool for INR 750 plus taxes. The annual membership for the pool will cost you INR 50,000. Gym plus pool annual membership comes at cost of INR 80,000 along with complimentary massages at the spa. Call (0336633 0000). The infinity pool on the 20th floor feels closer to the sky here than the seventh-floor pool at Swissotel. There is a jacuzzi along with a sunbathing deck, which can be cordoned off in the evening for a small party. Order your poison from the poolside bar or a detox drink from the ‘health food’ section while you laze on an inflatable tube watching the sun set. They also organise aqua Zumba classes on a regular basis. 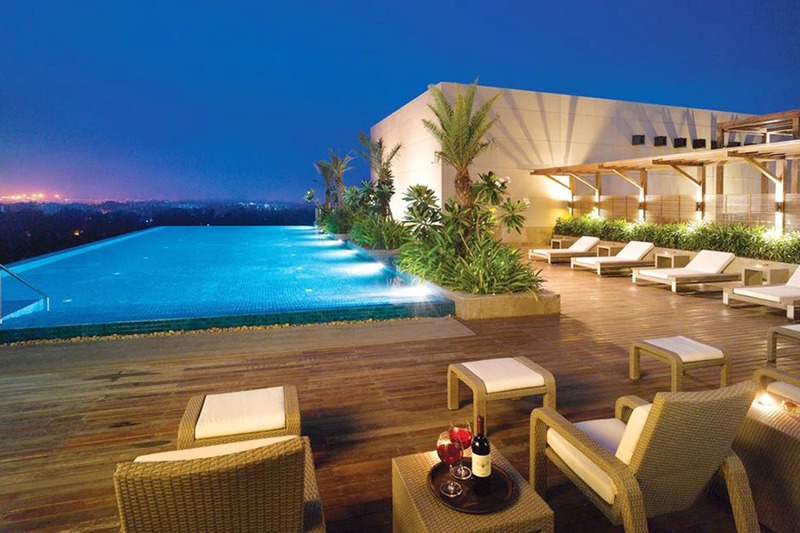 Radisson has a stunning rooftop infinity pool that offers great views of the bustling Ballygunge area. It is the perfect spot to relax after a hectic day in the Sun. The in-house spa offers amazing and affordable massage treatments for an even deeper relaxation. Pocket Pinch: INR 500 plus taxes for a day. They do not offer any membership plans as yet.